The Interschool Chess Challenge will be held in three stages - Local Heats, Regional Semi-Finals and State Finals. The three highest scoring schools from each Local Heat will qualify for the Regional Semi-Finals. Each school which qualifies for the Regional Semi-Finals can send 5 players to represent their school. The top three placed schools in the regional Semi finals will progress to the Finals. The selected schools send 5 players to represent their school. It is possible for a school to qualify two or more teams for the next stage in separate Local Heats. However, if a school has already qualified for the next stage, then each player who contributed to grand total of points for their school may not count their score again in future Local Heats. Local Heats are qualifying tournaments held at a host schools, where schools in a particular area can send any number of players to compete against each other. They are run as individual tournaments, but the top 4 scoring players from each school are added together to form school totals. The top 3 scoring schools at each Local Heat qualify for the Regional Semi-Finals, to be held in Term 3. Qualifying schools will be listed in the Qualifiers section on the menu. What are the costs for the school/participants? There is no cost to schools for hosting these events! The cost for children to participate in a Local Heat or Regional Semi-Final is $15 per child. Schools will be invoiced for all of their players after the tournament date – payment is not required in advance. If your school has serious financial difficulties, please contact us. We want all children to be able to enjoy the benefits of chess, regardless of their financial situation. In the Semi-Finals and Finals, the highest four scorers in each of these top three schools will earn medals. Each tournament will be played in a 'Swiss' format, with 7 rounds. All players will play 7 rounds, and will be paired against others on the same score wherever possible, or a similar score. 0 points are scored for losing a game. The winner of the tournament is the player with the highest overall score. The top 4 scorers from each school add their points together to determine the grand total of points for their school. The tournament will be played using chess clocks. The time control will be 15 minutes per player. A demonstration for new players on how to use chess clocks will be made before the start of play. Once a player makes a move, they need to press the button on their side of the clock. This starts the opponent's time ticking. When a player reaches zero on the clock, they lose the game. The 'touch move' move applies in all competitions. A player must move the first piece that he/she touches, if it is legal to move that piece. If a player touches an opponent's piece, that piece must be captured if it is legal to do so. If a player makes a legal move with a piece and lets go of that piece, the move cannot be taken back. When a player's king is in danger, this is called 'check'. That player must escape check immediately by either taking the opponent's piece, blocking the check, or running away with the king to a safe square. If there is no way to escape from check, then that player is in 'checkmate' and the game is over. A game is not won by taking the opponent's king. If a player makes an illegal move (a move against the rules of chess), then that move needs to be taken back, and a legal move played instead. No player is allowed to give advice to another player, while their game is in progress, including calling check, checkmate, and time (flagfall). This is cheating and penalties may apply (such as taking a point from a player's total score). If a player has a question or a problem at any time, they should raise their hand, and an arbiter will come over to help out. If players agree upon a result and shake hands, the result must stand and cannot be reversed. This means that is the player's responsibility to carefully make sure that a position is actually checkmate, if checkmate is announced by the opponent. 2) Set up the board correctly for the next round. 3) The winner needs to report the result at the results table. In case of a draw, both players should report the result. Any decision made by the arbiter will be final. Your school may wish to host a Local Heat in this series. The event requires a hall that can accommodate up to 80 students with tables and chairs. All chess equipment, trophies and certificates are provided. An arbiter and helpers from Sydney Academy of Chess will administer the tournament and prize-giving. The school will benefit from publicity of the event, and exposure to other local schools, teachers and parents. 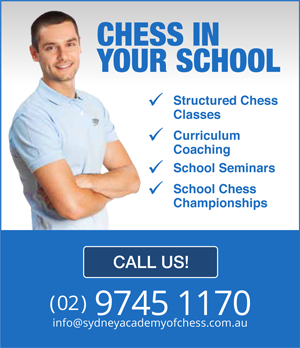 If your school would like to host a Local Heat, please call Sydney Academy of Chess on (02) 9745 1170.